Should this item be out of stock at the time of your order, we would expect to be able to supply it to you within 2 - 4 weeks. 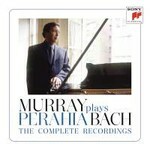 The first ever collection of Murray Perahia's Complete Bach Recordings for Sony Classical. The x8 original albums, recorded 1997 to 2009. Includes the famous Goldberg Variations (Gramophone Award) and English Suites 1, 3 & 6 (Grammy® Award), as well as the complete Partitas and solo keyboard concertos.